Yesterday I had the delightful experience of seeing behind the scenes at No.1 Saville Row home of Gieves and Hawkes. I was astonished at how many people work in the cellars below the shops on the Row and how much handwork is involved. 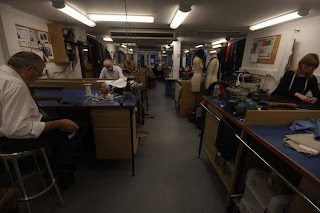 This is the view down the long room where most of the work is done, there are hardly any sewing machines virtually everything is done by hand, laying out, cutting, stitching and that takes a lot of people, all specialists in their own trade. And this is one of the specialist trouser makers. 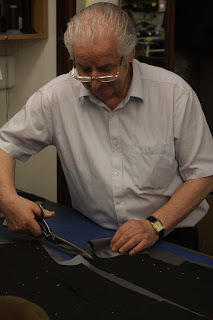 I did not note his name but he has worked there for many many years just doing trousers, doing them quickly and doing them well. They all deny that there is a hierarchy but everything that follows is dependent on the work of the cutter. The cutter is responsible for the design of the bespoke garments. Bespoke for those that don't know means you have a unique pattern made specifically to fit you. This is different from "made to measure" where an existing pattern is tweaked and sized up or down to get as close as possible to a fit. There is also a lot if difference in how it is made with made to measure being made in the same factories with the same machines as off the peg suits. 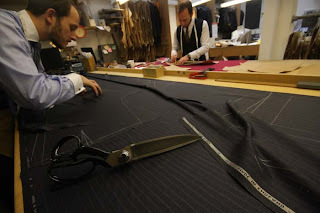 Bespoke is hand made all the way. In the background is head cutter Davide Taub who's blog gives an insight into the more interesting cuts and designs. 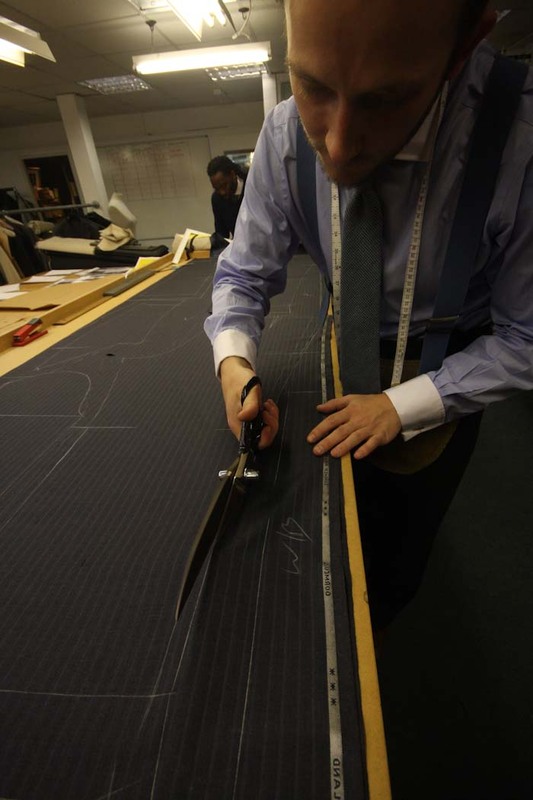 Having measured the client and discussed their requirements a pattern is made and the fabric is cut. Much of this was familiar to me as I spent a year in the 1980s working on a cutting table of a lingerie firm in Liecester. About 10 years ago the actual act of making on Saville Row looked under threat. High rates and rents meant that if left to market forces all the workshop space would be converted to sales space trading on the Saville Row name, but how long would that name maintain it's value if the bespoke business moved out? 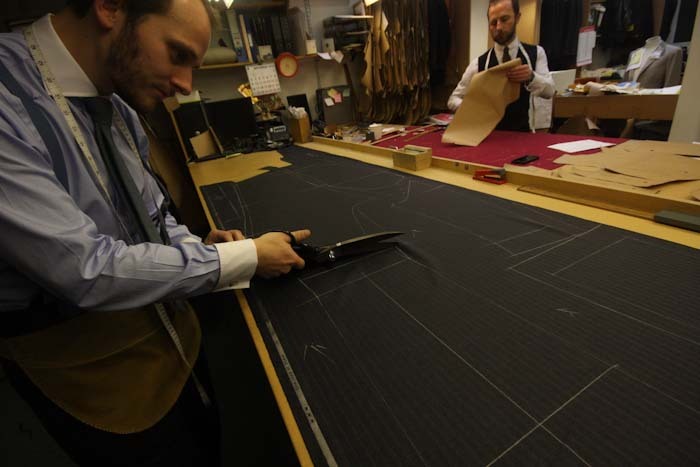 The Saville Row Bespoke association have done much to avert that potential decline and amongst their initiatives has been setting up a pre apprenticeship scheme at Newham college. This is one of the Newham College students on her first day on the Row watching and learning. Simply fascinating! And I'm very happy suits still are made in Savile Row.